Midichlorians were not there “since the first draft.” And over-explaining everything is not the only way to tell an “intelligent” story. The force is a lot of things (in my example, its comparison to life is as a metaphor). That’s the beauty of keeping it ambiguous and open to interpretation. Nailing down exact parameters is limiting. “Newer” does not necessarily equal better, you could make the ST about space janitors scrubbing toilets for 6 hours and it’d be “newer” for the series (and “more interesting” is a matter of preference, personally I think rooting the force in science is the opposite of interesting). And it’s not like the sequel trilogy is not exploring the force, it’s just not exploring midichlorians. The “real reason” they’re not using Lucas’s treatment is because even if Lucas ended up directing these films, he wouldn’t have used his treatment. Movies change and evolve significantly throughout development (now multiply that by 3). Look at the first treatment for “The Star Wars” and then look at the finished product and see what I mean. As for the Journal of the Whills, if Lucas really thought it was so important he would have included it within his “completed” 6 episode saga. I like the concept too, but it is weird to blame the ST for overlooking it, when it was never a real thing beyond a recurring notion in the back of Lucas’s head. Yes, 100%. Rinzler clarified this edit on starwars.com, it’s all in the thread Dom posted. It’s possible, but George contradicts himself so often in interviews that it is hard to say what he did or didn’t know early on in production. Like he says the films were always meant to outline the rise and fall of Vader, but is clear he didn’t plan for Vader to be Luke’s father until writing ESB. That’s okay, it is just not fair to fans to make them think he had it planned from the beginning when he didn’t. Originally the Force came from crystals, and of these crystals was the MacGuffin for an early draft. I would say he was figuring out the Force as he went along. Those beings at the end of the Clone Wars weren’t stated to be Whills, but Force priestesses. They may have been, but it was never clarified, which makes me think they weren’t. If the Force is meant to be a faith-analogy, then I think the Force can be explored, but should always remain ambiguous and mysterious, even if it is a real thing. Even though it is a real energy field, you still have people who interpret it differently: the Jedi and Sith have to completely different philosophies on the function of the Force, and both would say the other doesn’t understand it. Then you have creatures like the Bendu who see themselves as in “the middle”. You could have people like Kreia, who see the Force as evil and wish to destroy it. Basically, the Force needs to be ambiguous enough for it to be open to interpretation, like how many real world religions interpret our own reality. Thanks for the detailed and in depth review RL, though it just demonstrates to me how people can have such drastically different opinions and viewpoints on nearly every part of Star Wars. I agree that the force should remain undefined and mysterious but I’ve never seen or recognised any suggestions that it has a will or semblance of conscious action. Not sure about any of that sorry except that the force does appear to be stronger in certain places, though that could also just be down to the sheer concentration of life in that area (and therefore the force which surrounds and binds all life together), creating a force “hot spot” or “pool” such as Dagobah however Dagobah itself seemed to be something else again. I simply put this down to the religious like following and reverence that the Jedi Order held and built up around the force, almost worshipping it and despite Quigon’s obvious rebellious and fringe following of the order I still put what you quoted him as saying along with other things down to this dogmatic following that has existed for a thousand generations (a freaking LONG time). I never took it that the force is literally affecting events and showing signs to it’s followers in trying to communicate it’s will. It is a simply a force that exists and even the most benign and altruistic follower will still unwittingly apply their own lens and interpretations to such things in trying to gain understanding and some form of purpose to the existence of this force and their own relationship to it. The prophecy like prophecies from any other religion is very broad and undefined, lending itself to many different interpretations or people that could be considered the chosen one. Quigon believed Anakin was the one but it is never confirmed and it could just as easily be a reference to Luke who convinces his father to return to the light who then kills the Emperor, removing the only two Sith in existence and therefore the corruption of the force, returning it to balance. I think the force is in true and absolute balance when no one is using it. If the Jedi only actually use it for defence and there are no Sith around to corrupt it’s use for evil deeds (therefore the Jedi shouldn’t need to use the force in any great amount) then generally it is going to be in a stable balance. The prophecy stems from the Jedi though so it is really talking about a balance from their perspective which essentially IS the non-existence of the Sith. As said above, I do believe the force is stronger / weaker in different places around the universe. Maybe think of it as “pools” of force that get shallower the further out from them you get but they all generally overlap and flow into each other in a galactic network of pools of force that concentrate around mass and concentration of life, a few being particularly deep pools. I think the Jedi’s diminished ability to use the force in the PT is specifically in being able to feel and see possible futures and communicate with other Jedi and it’s simply through the sheer corrupt use of the force that is clouding the pools. We never actually see it directly affect their use of the force in combat, only in seeing through the “pool water”. But yeah, I don’t see anything in Star Wars that indicates a predetermined destiny for anyone and the force certainly has nothing to do with affecting fate apart from how one uses it which is a result of character actions, not some mysterious influence. The ally quote is an figurative speech, not meant to be taken literally. I actually find much of your interpretation of things to be overly literal, which is funny considering Dom’s comments on my own recent posts. I can be very literal and logical at times myself but it’s in my method of thinking, not so much taking everything at literal face value however when I see an orange I will call it an orange even if there is greater meaning to be gleaned from deeper thinking and/or in context to all the other contributing factors. Again I see this as figurative speech that equates to a subconscious and instinctual control of your actions that is derived directly from the glimpse of the future that the force gives you (Jedi reflexes and accuracy) which in the immediate future is nearly without question but those with a stronger command of the force will gain an ever so slight edge over those of lesser strength. Basically a pre-cognitive feedback loop that you surrender yourself to in order to gain it’s advantages in combat and survival. Sorry but at this point I personally can’t put credence in anything based in the ST and the Ep7 title to me was only meant to be symbolic in nature, not confirmation that the force has agenda and purpose though JJ and Rian to a larger degree with Snoke’s comment (on top of it being a bandaid / stopgap to criticism of Rey’s ridiculously fast mastery of the force) seem to have taken that line and run with it, another reason for me not to like the ST as it’s sounds and feels stupid to me since it’s at odds with how I have interpreted and understood the force in the OT for 30 years, even if just in a more basic and formless “feeling” of how it works before I delved into it in recent years. I can see your logic but it just doesn’t sit right with how I see it. I believe much of it can be explained away by other means and the ST simply locks in a certain line of thought that might have previously been there as one of many options but now has narrowed the possibilities and therefore it does start to remove the mystery and unfortunately it’s not compatible with my how I interpret and understand the force as presented in the OT. Thanks for the effort in explaining your own viewpoint in such detail and I don’t mean to be so rigid myself except that I’ve never had any issue with how I understand the force and I greatly enjoy the OT with that understanding and so I see no need to change it in order to accommodate new movies that I don’t like for a plethora of reasons anyway. Valheru, you’ve missed my point entirely. I’m speaking about it from a meta perspective. Star Wars being “meta” is another reason I don’t like the ST, so that’s not helping your argument. Star Wars is and has always been escapism for me so I don’t need nods and meta references breaking the 4th wall for me. Also I don’t think anywhere in the films is it explicit that the force has a will of its own. Some characters might say it does, but that’s their opinion. The films purposely leave it open to interpretation, so if it bothers you it’s easy to imagine it isn’t the case (or perhaps if you want something to complain about, you can imagine it is). No. You misunderstand me. My analysis is from a meta perspective. I’m talking about all the movies, not just the ST. Thanks for being pretty civil, Val, and sharing your own opinion with me. I like how you also mention the Force having strong points, almost like pools of life or the Force. I’ve used a pool or water metaphor before to describe the Force, and that Jedi go with the flow of the current of the Force, while the Sith try to dam it and redirect that current to serve their own purposes. It’s very similar to how one might describe Taoism, and how the concept of Wei Wu Wei within Taoism is like the idea of “going with the flow”. Although the Taoism doesn’t necessarily have “pools”, but maybe you could argue places full of nature might be more in line with the Tao, and more balanced, than places like cities for example. That could also explain why the Jedi gradually became weaker in a cityscape like Coruscant as well. I think you could also describe the Force in terms of electricity, and how those pools could be like “hotspots”. A lot of my earlier examples fit with those terms as well. I still personally believe that the Force is a dynamic system. The fact that Force can even be out of balance in the first place demonstrates this to me. And the fact that Anakin fulfilled his destiny also does seem to lead credence to the idea of destiny. But that’s just me. I can definitely see how our own opinions can kind of influence our own definitions of the Force, but I would definitely suggest that we should just be open-minded about how the Force works. The force has always represented meaning in the story and characters even if doesn’t always literally mean something on a literal plot level. So it’s not necessarily that the force is a sentient determiner who’s giving the saber to Rey, it’s more like Rey has the stronger force in the scene because the film is saying something about these two characters. Kylo sees the saber and claims it as his own. But ultimately the weapon and what it represents belongs to Rey. At no point I have I moved the goal posts. I made a post, you didn’t get what I meant, and you seemingly have gotten no closer to understanding. I don’t blame you because my first post was worded weird. But in subsequent post you’ve just been arguing against a point I wasn’t making and all I’ve been saying is that you’re misunderstanding me. 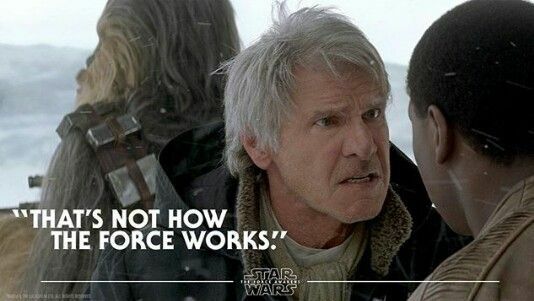 To clarify, what I meant is that the force has always had more meaning in the story than just as a plot device. There’s a metaphorical aspect to it as well. In the original film, the force represents Luke’s calling, and ultimately his potential to do great things. It’s not all about the literal interpretation. Luke turning off his targeting computer and acting on instinct is what lets him succeed in his mission. The literal interpretation here is that acting on instinct helps Luke better utilize the force. But the non-literal messaging is that Luke succeeds because he trusts in himself and his instincts. So the force is an agent for representing meaning in the film beyond the literal. Hopefully this makes more sense now. Also I took Rey’s force pulling and catching the lightsaber in TFA as taking Kylo by surprise, especially with it already traveling in that direction it would only take a quick last second use of the force to alter it’s course to miss Kylo and go to Rey instead. It has nothing to do with the Force choosing Rey over Kylo as to who should have the saber, in my eyes THAT is plain silly and twists my concept of the force into something unrecognisable from what I grew up with from the OT. I understand what you’re saying above in your clarification but all of that is still derived from character actions, there is never a point where characters are directly affected by something the force is doing. Whereas the ST would have us believe that events are being influenced to some extent by the force which is completely counter to my understanding of it. In dissecting your initial post to try and garner your intended point, I think I can now see that you’re simply saying the force is actually stronger in Rey during this scene which is why it goes to her instead (though I still just put it down to her hijacking Kylo’s in flight force pull, surprising him who didn’t consider her a threat in any way, especially seeing that they were in a stalemate trying to force pull the saber in TLJ) and that this is trying to say something about the two characters. But why is Rey stronger here? Why does that then mean that the saber and what it represents “belongs” to Rey? What do you actually see or understand in the movie that gives you this impression? Your initial post still seems to somewhat support what RL is saying in that the force is influencing these events because you are attributing the decision to the force. If it’s an attempt by Rian to imply a metaphorical message then he has gone about it arse about which is why it doesn’t make sense to me. Yeah you’re definitely closer to what I’m trying to say. Basically, the argument is that (as RL stated earlier) Rey is of “purer intent” than Kylo - she’s fighting for the light and him the dark. He had a chance to take the mantle of ‘hero Skywalker’ but chose the dark path. The saber represents and recalls the weapon of the savior of the galaxy, in the PT it belongs to the “one who will bring balance,” and in the OT it belongs to the “last hope.” In the ST, the saber is metaphorical of the new mission to reignite the spark of hope and take up the fight (this is pretty explicit in TLJ, less so TFA because of rewrites). Kylo wants the saber because of his birthright, but what it represents doesn’t belong to him, it belongs to Rey. So when the lightsaber goes into Rey’s hand and not Kylo’s, in my mind the literal question of “how did it get there?” -whether the answer is that Rey is stronger in the force, Kylo was caught off guard, or the force is exerting its will - doesn’t matter. What matters is the figurative meaning of the scene - Rey has finally taken up the saber and the mantle it represents which she initially rejected, and which at this point she is more deserving of than Kylo due to who she is, and not who her parents are. Nice one Dom! Great post! You made me appreciate TFA more! Thanks. It’s good to know at least sometimes I say things that make sense. What’s funny is initially Kylo’s line of “that lightsaber belongs to me” wasn’t one of my favorites. I sort of just saw it as part of an underdeveloped subplot (him collecting Vader stuff) and a remnant of an different version of the film. But I think upon further reflection, especially in light of TLJ, the line still holds a good deal of meaning for the character and story. I’d be very curious to see what that earlier version of TFA was like, where there’s no map and everyone’s after the lightsaber. The fact that the saber represented the search for Luke/hope would have been a lot more explicit, though perhaps the biggest issue was that it was hard to figure out the non-figurative importance of the object (how would a lightsaber help them find him exactly?). But the meaning still shows through when Rey finds it and her subsequent talk with Maz, and the scene I mentioned, and of course when Rey brings it with her to Ahch-to and offers it to Luke. A meaning which continues throughout TLJ (as I believe I’ve written about before a couple times), and hopefully will continue into IX (getting back on topic). TLJ ends with the saber broken, but of course Rey’s still got it. If we were to extrapolate what TFA and TLJ are telling us, then we’ll see Rey with a repaired version of the saber, which will have something significantly different about it. In my mind losing the saber completely would go against the ethos of what’s been established for the character (i.e. not killing the past), and simply reviving the saber as it was would be lazy and also go against what has been set up (she’s forging her own path). We’ll see. This got me thinking. If Ben is redeemed, I think it would make sense if the saber went to him. Ben accepting and turning it on would be a powerful visual, showing his turn to the light and perhaps remind us of the scene where Luke gets the saber from Obi-Wan, with unknown adventures ahead. It would symbolize the hero and the Skywalker within him. “It belongs to me” would get a new meaning. The saber being broken but repaired would of course symbolize Ben himself, especially since it was repaired by Rey much like Ben might be. Rey handing the saber to Ben would be a callback to her handing it to Luke, and Ben accepting it would symbolize him giving Rey the belonging she was searching for in Luke. “It belongs to you”, she might say, tying their story arches together. That would be pretty great and epic if you ask me. I don’t think I would like that. If the ST has one core theme, I would say that lineage is not important. It’s the choices you make. Rey has thusfar made the right choices, whilst Ben made the wrong ones. Rey should be the one who builds a new future on that basis. For Ben to be redeemed, he should recognize this. It is not his birth right. He doesn’t deserve that lightsaber. She might offer it to him, but he should reject it imo. I imagine we’ll be getting a title for Episode IX during this - and maybe some sort of teaser trailer. Wouldn’t you say that the lightsaber represents lineage? If so, it would reinforce the unimportance of lineage if Rey gives away the lightsaber and forges her own path. We are made to believe that Rey is “worthy” because she gets the lightsaber, when the point should be that she is worthy even without it. Ben on the other hand seems to care more about lineage. “Forget the past”, he says, and yet he talks to Vader’s helmet and claims ownership of the saber. If he received the saber it could be a key to understanding where he came from and perhaps it would give him a feeling of responsibility to uphold the legacy going forward. We are digging into this way too much. If Rey offers Ben the lightsaber, he could accept it or refuse it. Either way would have the same meaning: that he has been redeemed, and is either worthy or Rey is worthy.